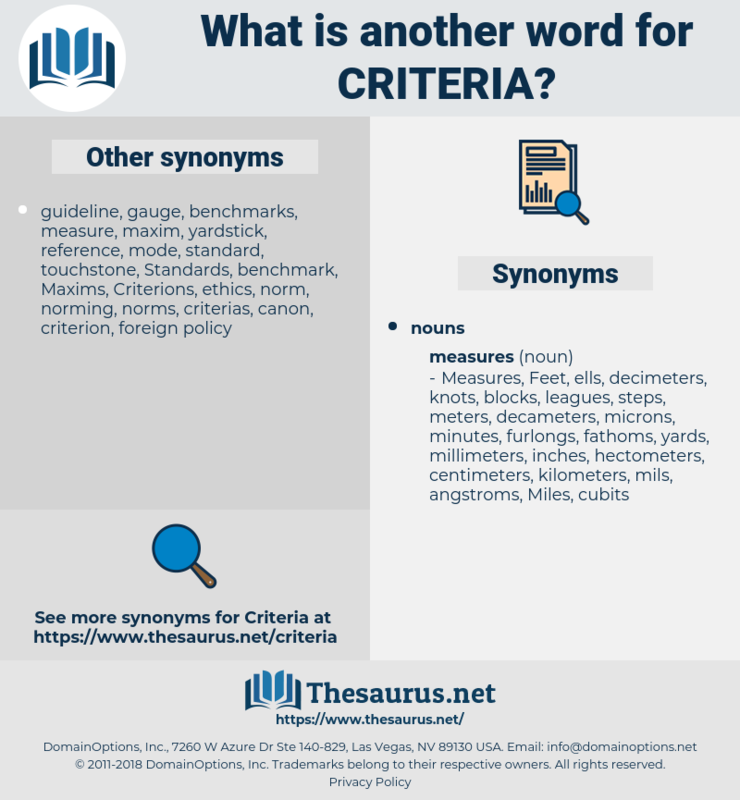 What is another word for Criteria? Those, any, each, These, some. per, above, Whether, under, Whereas, If, Against. must, should, may, might, would. considerations, specifications, principles, appropriateness, factors, preparation, conditionality, coordinated, valuation, tolerance, tolerances, institution, determinants, protection, directive, endpoints, significant, important, central, assessments, Assessing, randomized, ontario, relevance, parameters, commission, Keys, adequacy, terms, basic, establishment, factor, appraisal, issues, C, provisions, wto, modern, union, appendix, limits, senior, success, codex, facility, west, demands, tang, largest, medio, impact, european, CF, denmark, office, prime, b., list, leading, top, agri-food, chief, eu, bank, form, Forms, AGDM, drivers, fat, member, funding, large, big, united, standardized, lead, line, number. Recommendations, aggregations, Prescriptions, definitions, Evaluations, directions, notions, presentations, circumstances, Orientations, Regulations, expectations, coefficients, indications, doctrines, credentials, constraints, denominators, conventions, indicators, objectives, reservations, introduces, conditionalities, commitments, responsibilities, prerequisites, metrics, components, designations, beacons, concepts, limitations, reasons, assumptions, obligations, requisites, authorities, modifications, applicants, transactions, directives, options, document, points, emissions, characteristics, reports, ingredients, attributes, Environments, identifiers, Excipients, contents, perspectives, operations, interests, Foundations, submissions, outcomes, candidates, criterias, proceedings, motives, defining, opinions, viewpoints, instruments, procedures, milestones, contaminants, arguments, disciplines, Measures, lessons, purposes, matters, Indices, situations, R, Visions, references, recitals, positions, merits, precepts, projects, ethics, times, motion, baselines, traits, tenets, means, aspects, Categories, practices, ecological, experiments, Risks, arrangements, headings, substances, premises, teachings, assets, experiences, Investments, targets, paradigms, settings, complete, french, define, profiles, values, L, items, manitoba, homes, Exigencies, selected, Persons, costs, steps, Granting, rates, tools, modalities, Qualities, approves, Households, filters, services, valid, insights, Countries, burdens, variables, Judgments, pieces, sediments, precedes, accounts, defaults, regimes, enablers, guides, clauses, screens, annex, ways, audit, judgements, systems, aims, gauges, frameworks, Treaties, thoughts, Scales, codes, loads, Areas, SDDS, challenges, clues, res, laws, parts, maximum, themes, facts, amendments, considerations, Boundaries, specifications, materials, ranges, details, IMPACTS, grades, words, Ones, controls, statements, features, damages, patterns, data, Ideas, things, expenses, Goals, marks, principles, held, refers, schemes, Properties, Charges, kinds, levels, table, tables, factors, processes, aids, plans, requests, types, Axes, proposals, views, appeals, Eras, Activities, flags, changes, signs, calls, Programs, results, -rrb-, tags, 1998, 64, cases, claims, D, Parties, Classes, ex, Bases, markers, 2006, six, states, meetings, determinants, feelings, endpoints, LINEs, norms, assessments, relevance, parameters, Keys, terms, issues, provisions, limits, demands, Forms, drivers. satisfaction, implementation, jurisdiction, objective, necessity, reasoning, organisation, option, participant, duration, context, comparison, addition, instrument, scope, note, project, governance, picture, route, existence, clarity, priority, training, analysis, employment, format, exposure, aim, meaning, review, regard, culture, search, string, data, board, process, period, axis, ability, access, They, path, proposal, field, bar, map, program, determination, tolerance, protection, /, discretion, commission, factor, impact, list, form, member, funding, endpoint, measure, determinant, consideration, indicator, notion, parameter, definition, element, desirability, denominator, judgment. evaluated, measured, described, Assessed, specified, identified, Awarded, applied, weighted, proposed, used, Met, based. determination, norms, condition, threshold, guideline, Guidelines, requirement, Tests. 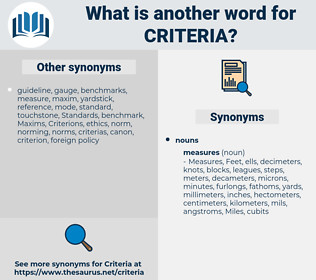 preconditions, qualifications, thresholds, Measurements, concerns, Indexes, choices, Policies, needs, rules, orders, Guidelines, Tests. evidence, yardstick, precondition, condition, qualification, norm, threshold, guideline, Guidelines, requirement.